May's been a little busier than usual for me, so my book intake for the month was slightly more limited as a result. 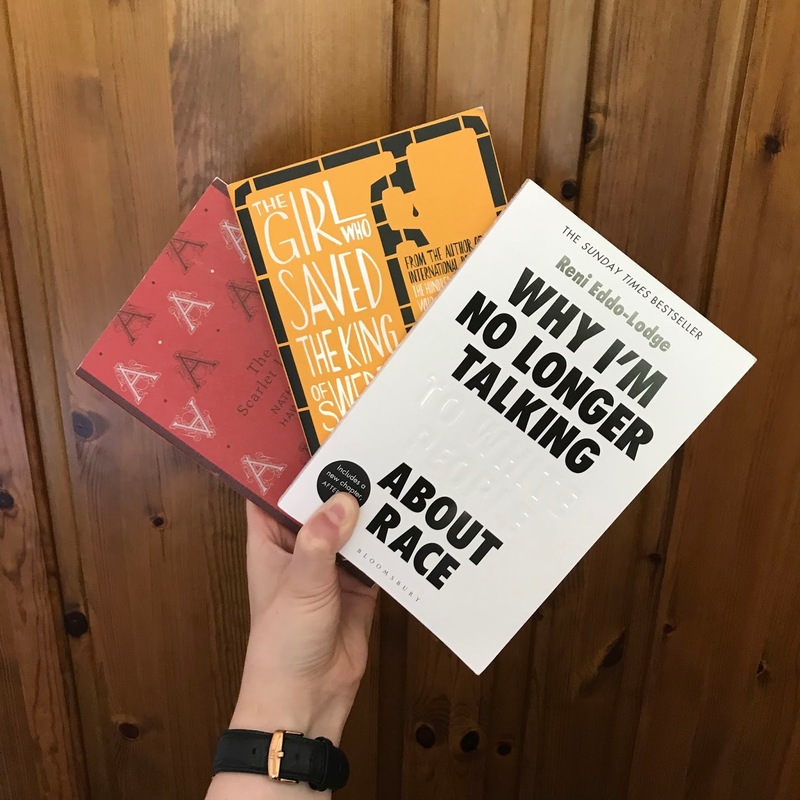 Nonetheless, some interesting reads, including a romance from the Victorian era, a recent humorous novel, a diary and a recent text on race and racism. An eclectic selection for the month of May. Honestly, wasn't a fan of this one. I didn't really like any of the characters and didn't find it to be a particularly stimulating read, with the style just feeling uncomfortable throughout, which made it quite the chore to get through. I never wanted to pick it up and read it, I had to keep thinking, 'oh it'll get better, just do a couple chapters,' but overall it just wasn't for me. It's kind of a historical novel come romance, which even as a genre didn't work for me. Historical novels tend to be something I enjoy, but I think the added elements of romance just didn't mesh well. I appreciate the struggle that the text poses and how Hester is represented throughout the novel - and therefore as a woman in history during the time period - but despite that, I just didn't like it. I was so excited to read this book having loved Jonasson's first novel, The Hundred-Year-Old Man Who Climbed Out of the Window and Disappeared, and I can safely say, this one did not disappoint. Jonasson's writing is so fast paced and interesting that you can get entirely lost in not just his stories, but equally his storytelling. His style is so colloquial that it often seems as though he's recounting something that's really happened, which I love and think fits in wonderfully with his stories, as his character leads truly eventful lives. I really liked the character of Nombeko and following her life and literal journey was something I considered genuinely intriguing and exciting. Jonasson seems to has an interest in nuclear weapons, as like his previous novel, this one also follows the goings on during the time of atomic bomb development. But he manages to make this seem like such a trivial task in his texts that it really makes you laugh at the enormity of what's actually going on in the books. I loved this text - I'm usually someone who prefers much more serious themes and styles, but Jonasson's writing is just sincerely entertaining and satisfying. One of my co-workers lent me this book and I could barely stop reading to take a sip of water. Since reading it, I've actually found out that it wasn't a real diary, as the anonymous author indicates it must be, which in some ways made me feel a little more comfortable about the book. By all means, the content of the text is not something that should make you feel comfortable, but rather concerned and upset and like you're losing a friend throughout - it did make me feel this way, especially whilst I was reading it and thought it was an entirely true story. The book is about a 15 year old girl who develops a drug habit, leading her to run away from home multiple times - some of which she was barely aware of what she was doing. It was traumatic and heartbreaking just as a reader, dealing with a great number of issues that young people in the 70s no doubt endured. It is an extremely well written text, which was what impressed me most whilst reading it believing it was entirely real - I was so intrigued that Alice had such a command of language and narrative whilst at the same time being a drug addict and struggling from one day to the next. I can understand why an author would have taken the opportunity to use a diary structure to comment on drug taking in the 70s, as it is evidently a style that elicits a response, but at the same time it's difficult to know the extent to which the text places itself in the real world, when it is in fact a fiction book. It's one that made me think a lot and feel a lot, but in the end I'm not so sure of what to make of it. I picked this book up at the end of last month and was keen to get stuck into it. Reni Eddo'Lodge's Why I'm No Longer Talking to White People About Race has been all over the internet since it's initial release just a year ago. Just the cover of the text itself is so striking, I instantly wanted to know what it's author had to say. The book is spectacular. It is informative, expressive and sincerely important to the modern day discussion on race. I felt that I learned a lot and thought a lot about what Eddo-Lodge offered in the book, and having read it I feel more informed on issues concerning race, such as feminism and class and how race is always interlinked. As a white person, I have, prior to reading this, deeply considered my position of privilege, but this really reiterated that to me and helped me to understand a position I have never personally been in. The book is up to date and yet historical, recognising that we must know where issues of race have stemmed from. I was blown away by Eddo-Lodge's articulation of the topic, simply laying the cards on the table in a way that's impossible to ignore. I hope that you too will read this text and truly take in what it has to offer, and you too will help the anti-racism movement in your day to day goings on. This book has helped reignite the message in politics and in society generally, so I hope that you and I and so many others can help keep it going.